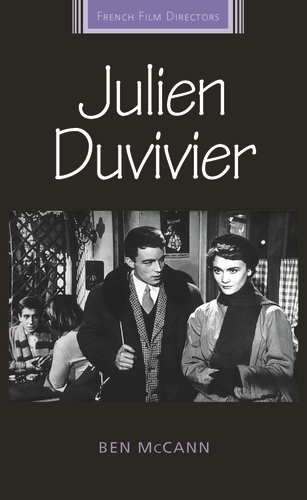 Julien Duvivier is the first ever English-language study of the French director Julien Duvivier (1896-1967), once considered one of the world’s great filmmakers. It provides new contextual and analytical readings of his films that identify his key themes and techniques, trace patterns of continuity and change, and explore critical assessments of his work over time. Duvivier’s career began in the silent era and ended as the French New Wave was winding down. In between, Duvivier made over sixty films in a long and at times difficult career. He was adept at literary adaptation, biblical epic, and film noir, and this 90,000-word groundbreaking volume illustrates in great detail Duvivier’s eclecticism, technical efficiency and visual fluency in works such as Panique (1946) and Voici le temps des assassins (1956). It will particularly appeal to scholars and students of French cinema looking for examples of a director who straddled the realms of the popular and the auteur. Ben McCann is Associate Professor and Head of French Studies. After completing his PhD in Bristol (UK), he moved to Adelaide in 2006. His previous books include The Cinema of Michael Haneke (2011), Ripping Open The Set: French Film Design 1930-1939 (2013) and Le Jour se lève (2013). For more details, including a sample chapter, go here. This entry was posted in News, Research and tagged French Studies. Bookmark the permalink.